Each month Vodafone dish out cash to a worthy local charity. The Community Connection Awards are a way to give back to the local communities in and around the towns, cities and villages where Vodafone stores operate. Often in partnership with local newspapers, they invite clubs, causes and groups to apply to win an award by asking how £1000 could really help. Today it’s the turn of the the Trussell Trust Food Bank. They support more than 1,200 food bank centres across the UK, with nutritionally-balanced emergency meals for people in a crisis. The £1,000 award will be used to buy food parcels, as well as hats, scarves and gloves for those in need. 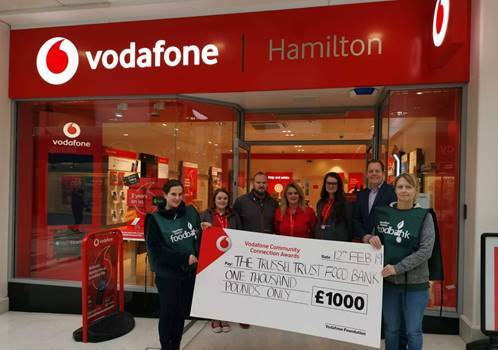 Isobel Graham, Trussell Trust Food Bank Manager for the Hamilton District stated..
We wish to express our gratitude at being awarded the £1,000 Vodafone Community Connection Award. A little thought and kindness can sometimes be worth more than any amount of money. The kindness shown by Vodafone is amazing, with this type of donation making the difference between someone having a meal or going without. Over 5,000 people were assisted by the Trussell Trust by from April to December last year. 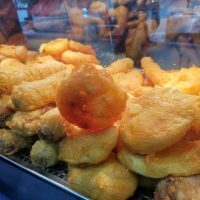 Get more inor on the Vodafone Community Connection Awards here. Join VOXI - Even if you're over 30!